Davam Urgent Care is a full service walk-in physician clinic serving the residents of Magnolia, TX and the surrounding communities. Our clinic strives to exceed the expectation of care and provide the best service possible. We never require an appointment, and make it easy to walk in and see a board certified medical provider during normal operating hours of 8am-9p, 7 days a week. Our walk-in clinic is equipped to handle minor to moderate illnesses and injuries. If your primary care physician is unavailable and you want to avoid the high cost of a freestanding emergency room, visit Davam Urgent Care in Magnolia. Urgent Care- Our clinic offers walk-in care for most non-life threatening conditions. Employer Services: Davam Urgent Care accepts most workers compensation insurance plans for pre-employment and on the job injuries. Our walk-in physician clinic also offers on-site digital x-ray, on site fully accredited lab, sports physicals, flu shots, tb testing, tetanus shots, and much more. Patients can visit us 8am-9pm, 7 days a week. We also now offer online-check in to make your wait time shorter and your visit more enjoyable. 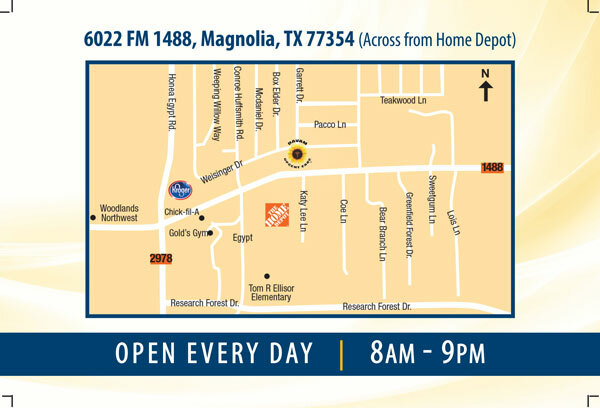 Davam Urgent Care is conveniently located in Magnolia at 6022 FM 1488, across from Home Depot. In addition to accepting most insurance plans, we also offer a medical membership program. Our medical membership program provides high-quality care at an affordable cost. Fore more information please contact us at (281) 583-1980.